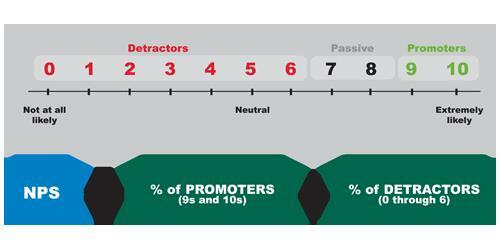 Promoters (score 9-10) are loyal enthusiasts who will refer others to your support organization. Passives (score 7-8) are satisfied but unenthusiastic customers who may choose another source of support if given the chance. Detractors (score 0-6) are unhappy customers who can damage your reputation through negative word-of-mouth. To calculate your support group’s NPS, simply take the percentage of customers who are Promoters and subtract the percentage who are Detractors. Your Net Promoter score can be as low as −100% (everybody is a detractor) or as high as +100% (everybody is a promoter). An NPS that is positive (i.e., higher than zero) is thought to be good, and an NPS of +50% or greater is excellent. IT support groups that track NPS will typically follow the initial question with an open-ended request for elaboration, soliciting the reasons for a customer’s rating of their IT support. These reasons can then be provided to front-line employees and management teams for follow-up action and improvement initiatives. NPS is a relatively new metric, and is currently tracked by approximately 20% of all service desks and desktop support groups. However, the vast majority of organizations that track NPS are providing support to external businesses or consumers, where NPS is considered to be a leading indicator of customer loyalty and follow-on business.